Jeri Smith-Ready: You-Pick Holiday Giveaway! It's come to my attention recently that I have a lot of stuff. Book-related stuff. Book-related stuff sitting in boxes and envelopes, unloved and unused. 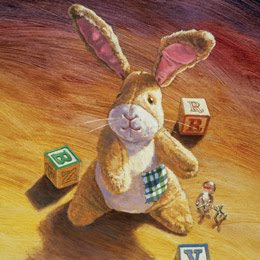 There's nothing sadder (except maybe an unloved stuffed animal, like the Velveteen Rabbit over there, although in this image he looks content, or at least pensive). So I've made a list of all my extra book goodies, and now I'm giving them away to you while raising funds for deserving organizations. Not only do you get to pick your prize from a wide assortment of signed swag, books, and ARCs, you get to choose the charity! Please read the specific rules below, but the basic gist is, you donate to the charity of your choice, forward me proof of your donation, then pick a prize from the list. 1. Because of the sheer volume of prizes, this will have to be limited to US addresses only. I can't imagine how broke I would become, shipping all this stuff overseas. Please check back next week for an international giveaway. 2. Donate online to your chosen charity. I don't care what it is--if it's tax-deductible (it'll say it's a a 503(c)(3) organization somewhere on its home page), it qualifies. So no political donations or contributions to your own Very Special Christmas Motorcycle Fund. 3. Forward me a copy of the receipt **within the body of an e-mail**, not as an attachment--I will not open attachments from people I don't know, and sometimes not even from people I do know. My e-mail is jeri AT jerismithready DOT com. Please use the subject line YOU-PICK so that I can make sure it doesn't get caught in the spam filter. 7. I will reply within twelve hours to let you know which prize(s) you got. I will also update this blog post at least once a day to show the quantity of each prize still available. 8. Deadline: 11:59 eastern, Thursday, December 16. This will allow me to get everything mailed on Friday so that there's some hope of you receiving it before Christmas.